I unhooked her chain and carried her in my arms across the yard, tears streaming down my cheeks. The “caretaker” stood by, unaffected by this dog’s state of health, and yelled out, “that’s not my dog.” “It” wasn’t “my” dog either, but she wasn’t going to starve to death, forgotten and alone in that backyard. She nestled her face into mine on that car ride and collapsed in my lap. She hadn’t given up on humans. 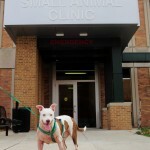 Summer-Sunshine was admitted to our emergency vet, weighing only 23 lbs. She was severely dehydrated, her skin was no longer taught—it felt like putty. Her gaze was distant and her sight impaired. She had gone a significant amount of time without potable water, so much that she no longer had an appetite, despite her state of starvation. Her body had begun to shut down. She may have had one or two more days left to live. Without snow on the ground to lick, her time was running out. 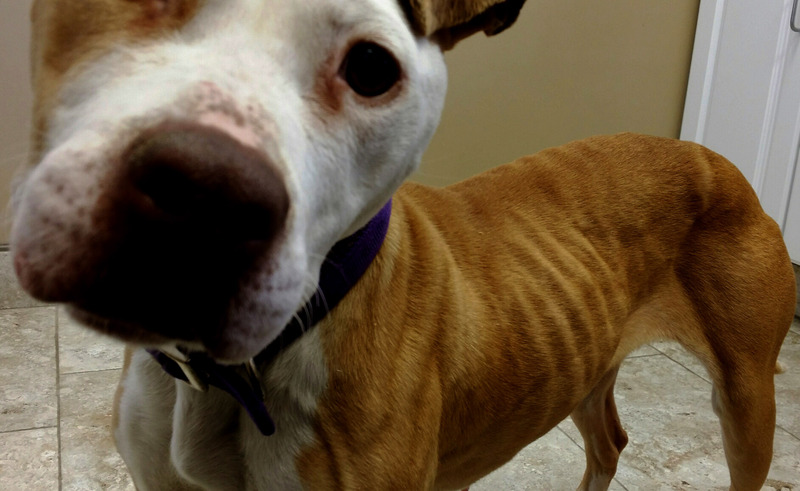 She was placed on IV’s and finally on day two, developed an interest in food. If A.S.K.’s outreach service hadn’t walked into her yard, she wouldn’t be with us today, and that is why your support is so critical! 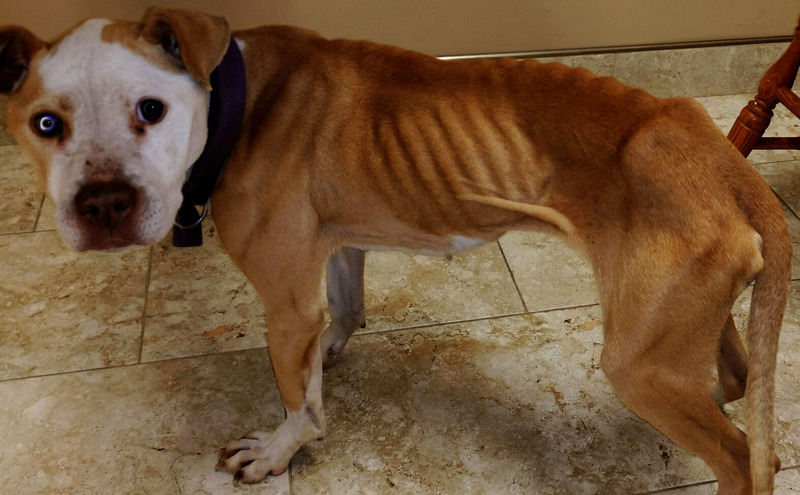 Summer-Sunshine was a victim of legalized neglect for some time: she was infested with whipworms and was heartworm positive. But she hung on, and had a will to survive. 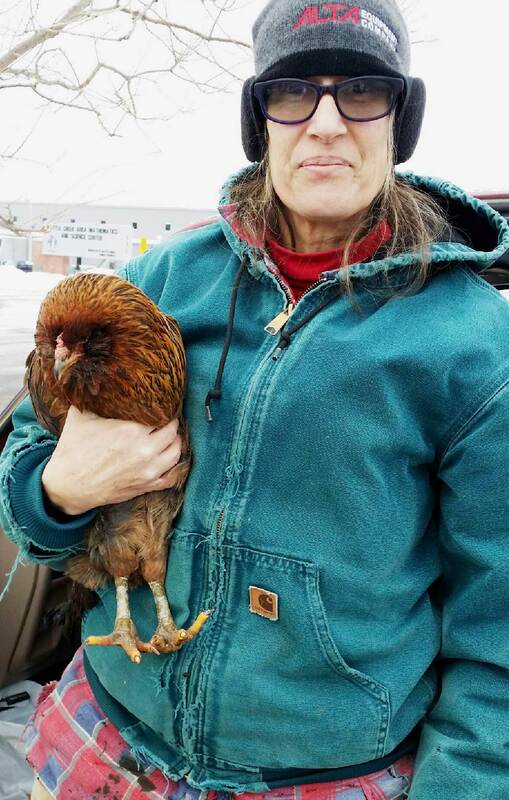 She’s a heroine for surviving the harsh Michigan winter without basic necessities and for not losing faith in humanity. Summer-Sunshine is finally in a state of good health. 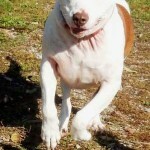 She’s an exuberant, loving, happy dog that now has a real family and life to call her own. 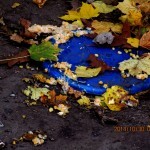 Summer in the fall, on a random A.S.K. visit. Many dogs don’t get regular meals without A.S.K. support. 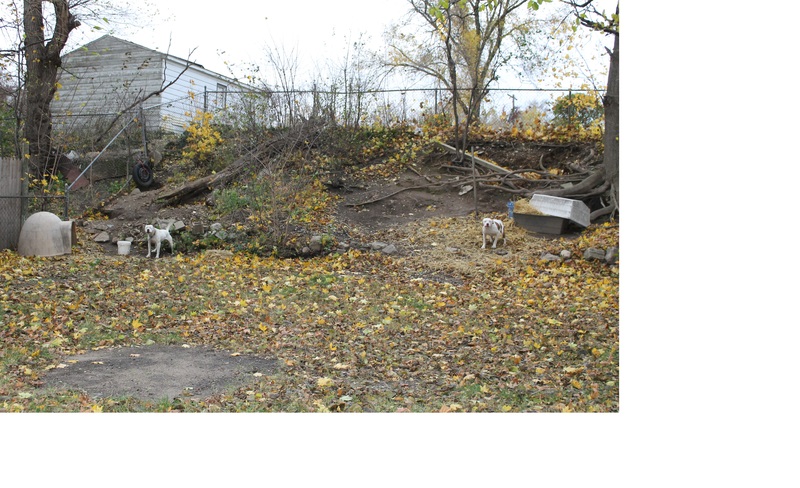 On rescue day, in the farthest corner of the backyard, forgotten. 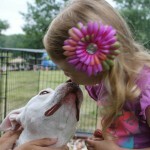 Summer collasped in her rescuer’s lap. She could have easily freed herself off the chain; she had hope that her “guardian” would feed her again. Summer’s new life started with her A.S.K. foster family! He sat on the end of a chain in the farthest corner of the backyard. 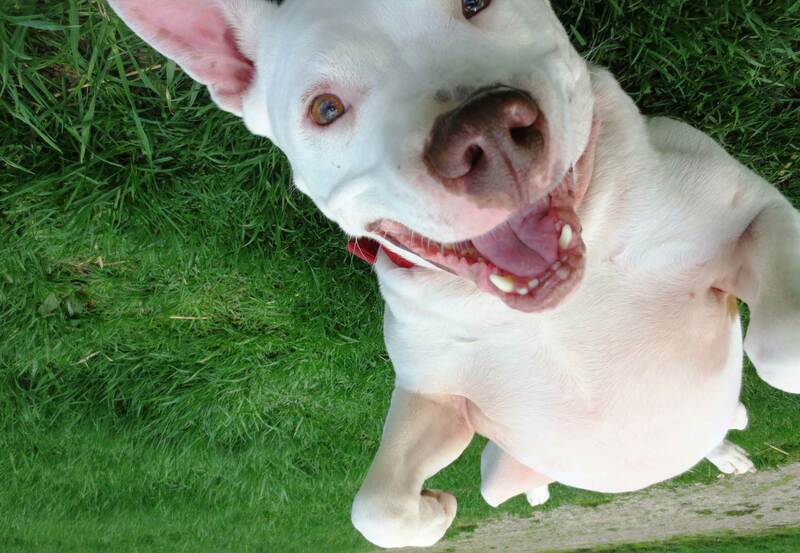 The family had reportedly acquired him as a stray, and his purpose soon became backyard lawn ornament, or as they thought, “backyard alarm service.” He lived on the brink of neglect, but fell within the socially accepted standards of the law. 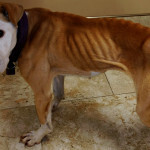 He had intermittent food, water, and a doghouse. And they named him “Chance.” Living 24/7 on the end of the chain apparently was the “chance” at life they had afforded him. 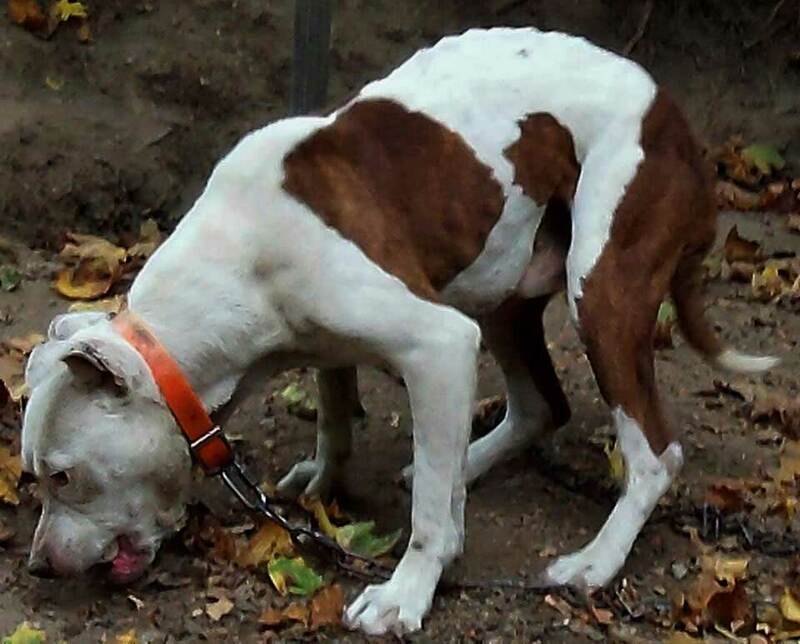 Keeping a dog chained 24/7 was the only way they knew to keep a dog. 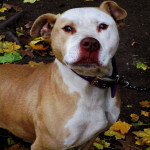 Another dog paralleled him in the opposite corner of the yard: Chyna (check out her survivor journey too). A.S.K. 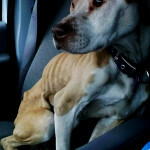 found Chance as we drove up and down the city streets searching for dogs living outdoors. 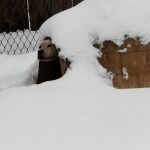 And we immediately got to work improving his life: for the first time he had straw bedding, vs nothing at all, and he had a doghouse with a floor in it, another big improvement to his former dilapidated wooden doghouse. We got him off a short heavy chain, and onto a long light-weight tie-out. 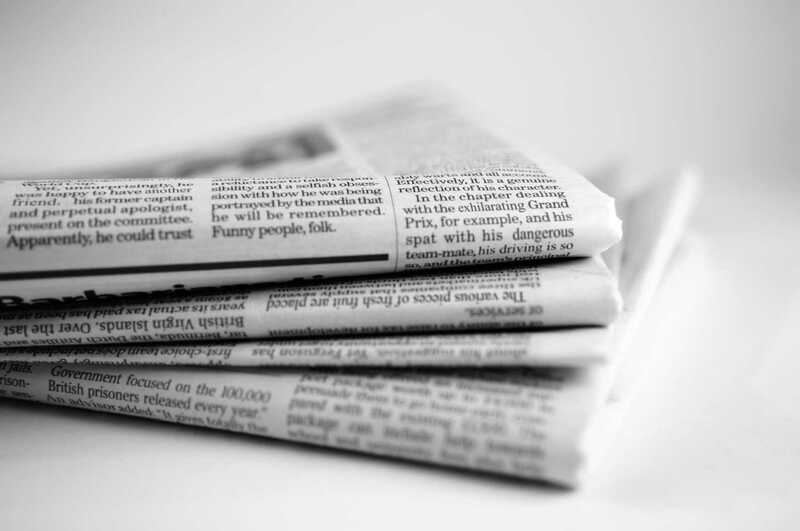 We started important conversations with the family about his needs that weren’t being met in anticipation of encouraging them to set a better caretaking standard. But it was a BIG challenge. Lacking finances, emotional struggles and family members going in and out of jail created an environment where Chance was put on the back burner. Eventually a longer jail stay by Chance’s primary caretaker prompted the family to surrender him to A.S.K. Chance became Monte, and a life filled with love began. 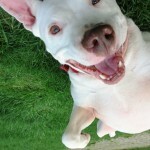 Soon after rescue we realized Monte was completely deaf. 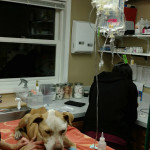 This dog had been left outside 24/7 without one of his primary senses, which added an extra layer of sadness to his case. Life was going good until a freak accident that could have cost him his life. 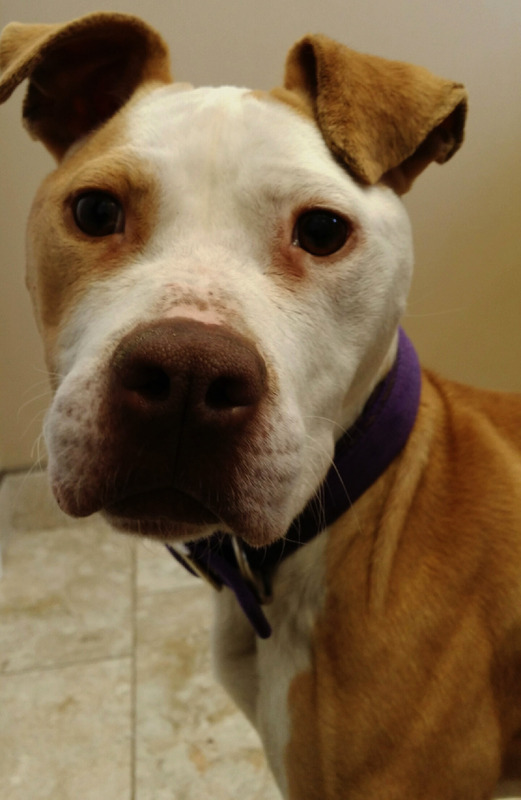 Monte had started to develop environmental allergies, and to alleviate the discomfort around his neck, his foster family put a chain collar on him, not realizing the risks. During supervised playtime with their family dog, his chain collar got entangled in their dog’s paw, choking Monte until his tongue turned blue. Luckily his foster parent was present and with much effort, amidst an ensuing dog fight, she got the collar off, and the dogs separated. Because her dog’s paw had gotten tangled badly in the collar, he naturally retaliated on Monte, biting him repeatedly in his arm pit—the only place he could reach. 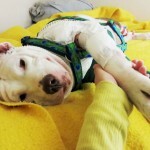 Monte sustained the worst of the injuries and was rushed to Michigan State University’s ER. He required blood transfusions and life support. 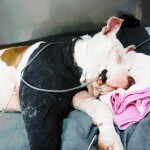 We weren’t sure if he was going to survive the damage due to the state of shock his body had went into. 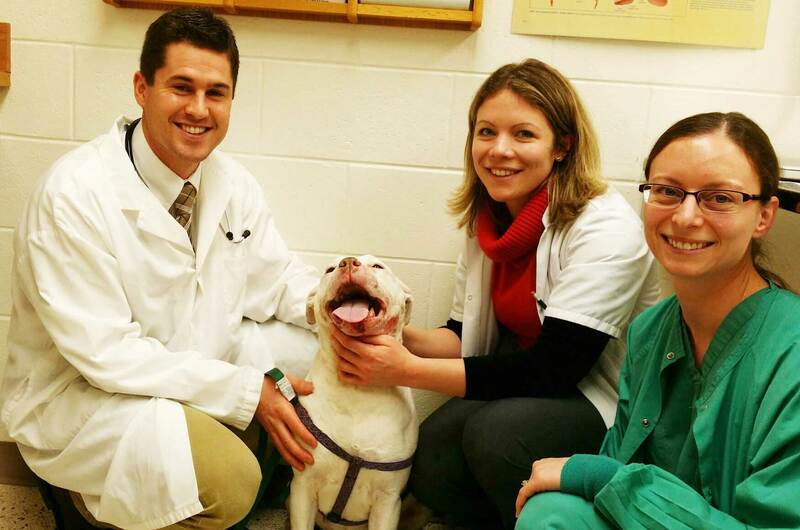 Over the course of weeks a team of veterinarians and A.S.K. 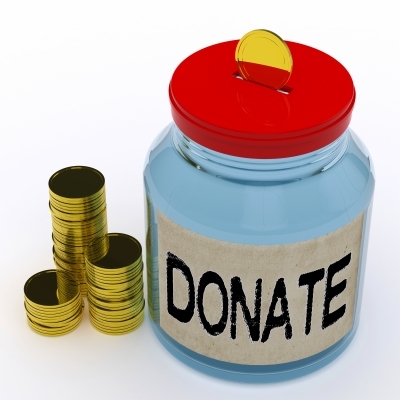 donors saved his life at a cost of over $9,000. 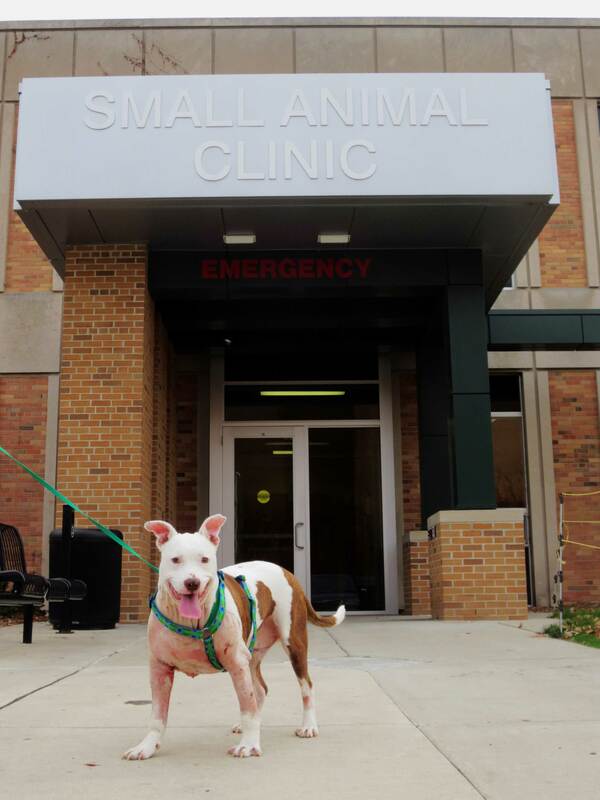 Monte started a new life once again, and became known affectionately as “Lammy K Pye,” a dog that has won the hearts of many as being a true survivor. He’s not only thriving, but he can run and has had no long-term damage despite the severity of his injuries. Lammy now resides with an A.S.K. board member and a pack of fellow dogs! This story also serves as an important reminder that there are many seemingly benign risks to our animals. 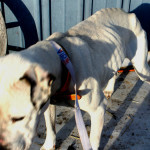 Chain/pinch collars are prohibited from use in our organization (even before this incident) and we are quick to replace them when we find dogs on the streets wearing them. Lammy has a heart of gold and is one of the most loving and happiest dogs we know! Before A.S.K. : skeletal & alone outside 24/7. Lammy upon intake to the Michigan State University ER. Lammy was heavily medicated during recovery. Lammy was immobile for weeks. Lammy walks out of the ER department ready to re-start life! Therapy involved wearing many drainage t-shirts! 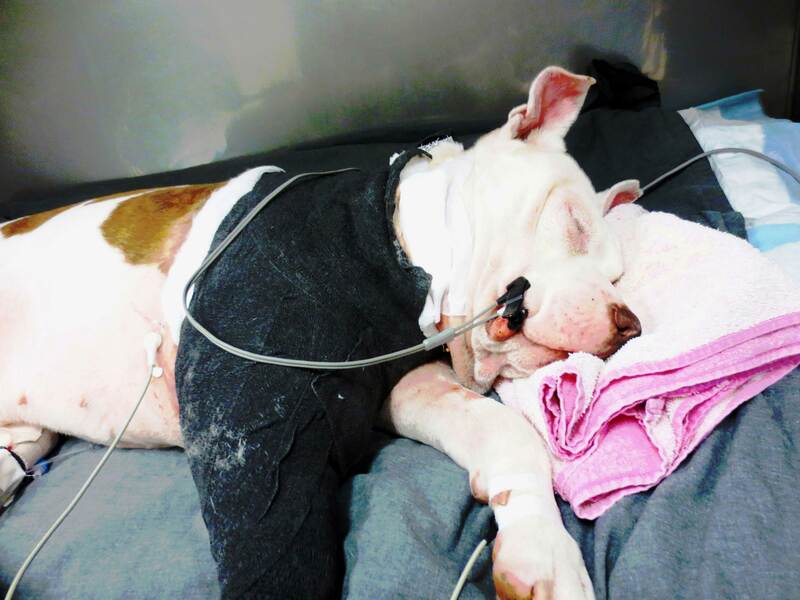 Perception: he had the same amount of love to give from the end of the chain, but was viewed by many as an “aggressive pitbull,” not “worth” saving. Lammy regains full use of his front leg! She was the token “aggressive guard dog,” although she could only guard the 6 foot radius allowed by her chain. She acted vicious, unhappy and ready to fight, all very predictable behaviors for a dog that had been mostly ignored and kept alone 24/7. We weren’t deterred from showering her with treats, chews and toys. She deserved better, and our goal was to facilitate that via free support for the family. We didn’t give up. And we spent years. 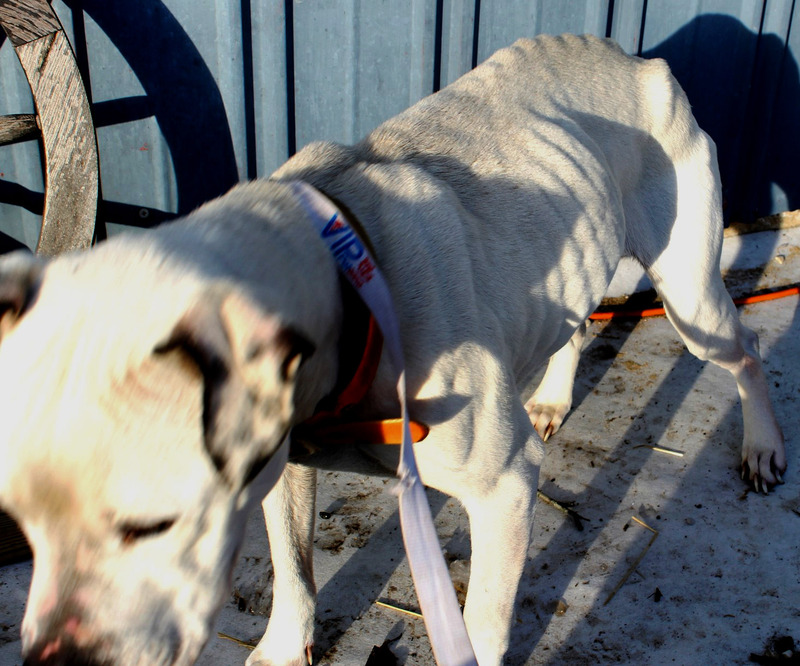 Her family was unstable, in and out of jail, and animal control’s regular visits didn’t aide in her removal. 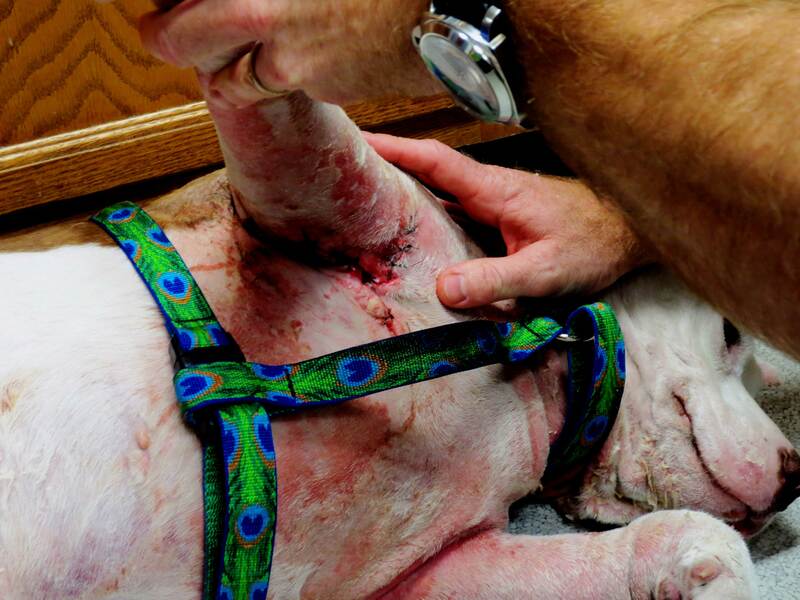 The day her life changed was the day that she was found almost dead. It’s a sad, harsh reality that her status had to get to that point, but reforming caretaking behaviors isn’t always possible, despite our best efforts. 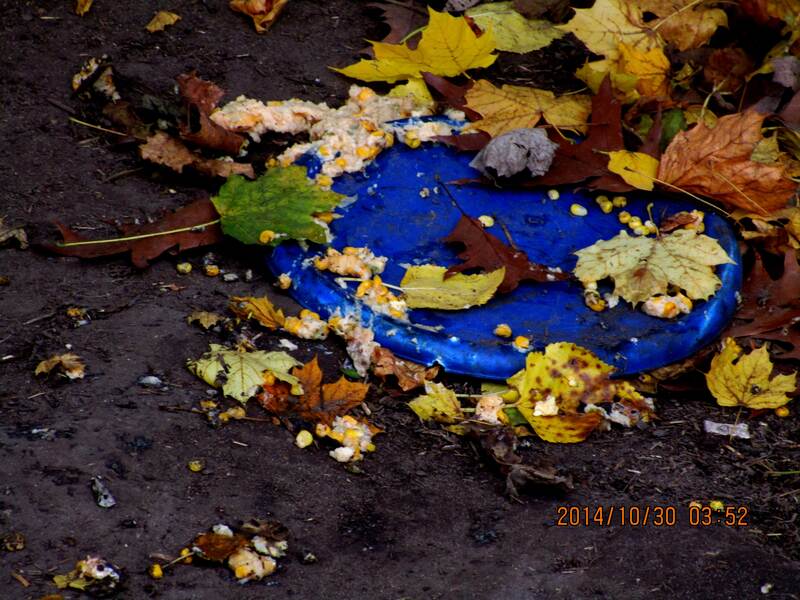 It was the “arctic blast” of 2013. Temperatures were severe and below-freezing. A.S.K. walked through deep snow into her backyard to make yet another unsolicited visit. No one called to report her. And no one had asked for help. And there were no footprints to her doghouse. Chyna didn’t want to come out of her doghouse that day. Finally we coaxed out a dog that had clearly stopped being fed since the last time we visited. It was hard to imagine “WHY.” And no answer would have sufficed. She was frail, and every bone protruded in her body. A.S.K. wasn’t leaving Chyna forgotten to die in her doghouse. 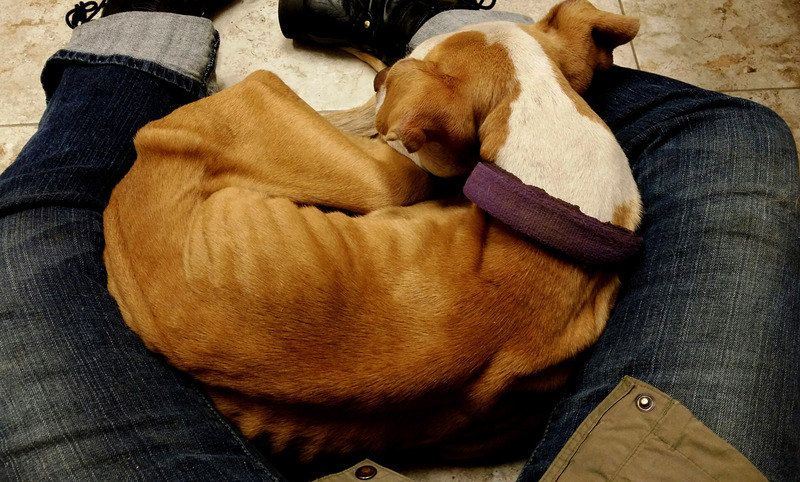 We engaged Animal Control and she was confiscated on the spot, while we continued serving other dogs on the street. 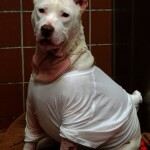 But we knew Chyna’s fate would be bleak at the shelter. 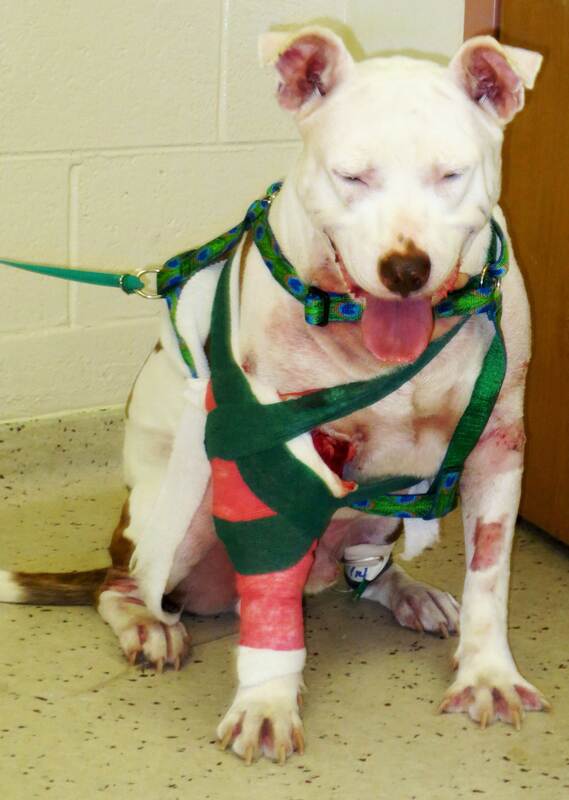 She was aggressive and unsocialized, just the type of special needs dog we’re here to help and save. Prosecutors dropped her case, and A.S.K. 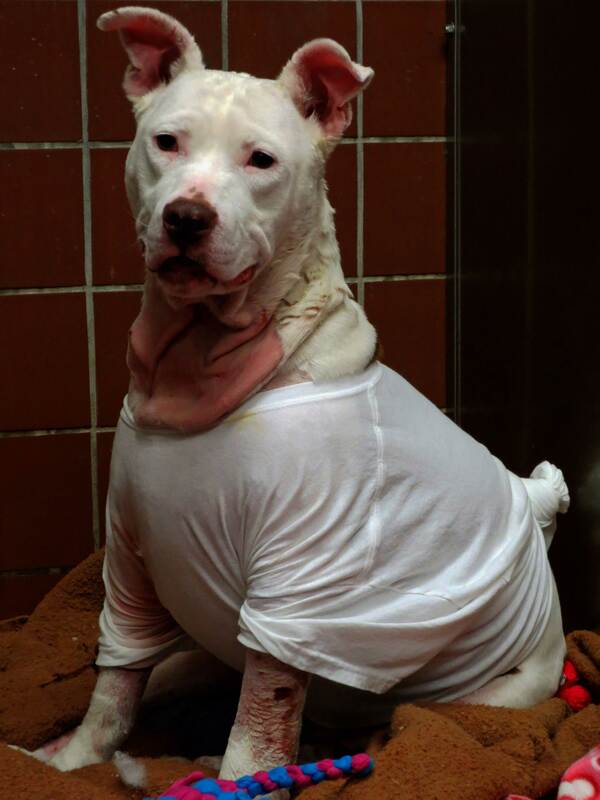 was at the shelter to rescue her when others couldn’t even get her out of the kennel due to her behavior. We knew immediately how to win her heart: slowly, and through allowing her to closely bond to one person. 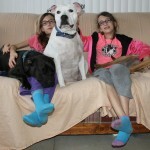 Our special-needs foster parents had room, and a willingness to try. 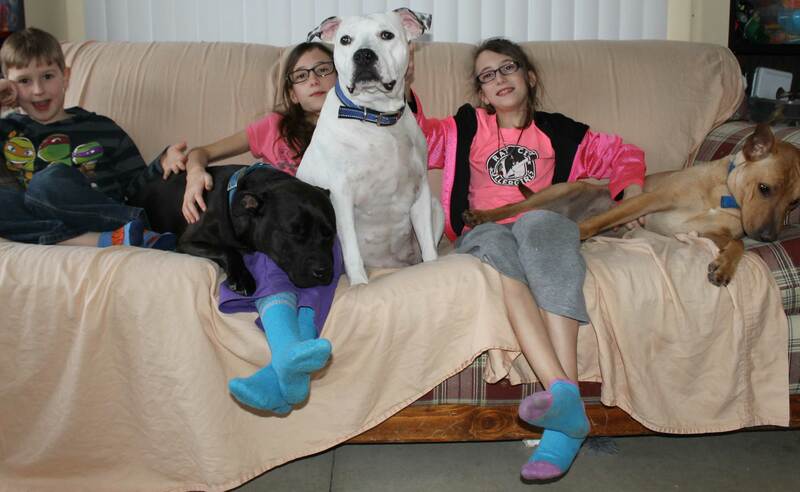 These are special families that don’t believe in giving up on a dog. And when she bit them, they didn’t throw in the towel. They kept on showing patience and love. 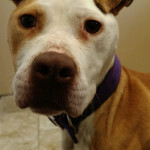 Today Chyna is a permanent member of their family. She’s the grandchildren’s friend, and sleeps in their bed. 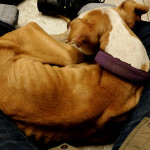 Many rescues wouldn’t have given her any chance, biting and growling from the end of a chain. But we chose to see past those superficial behaviors, and that’s who A.S.K. is. We save lives and believe that ALL lives matter. Before A.S.K. 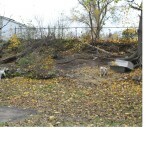 : Monte (Lammy K Pye) & Chyna were yard-mates, destined to a bleak future. 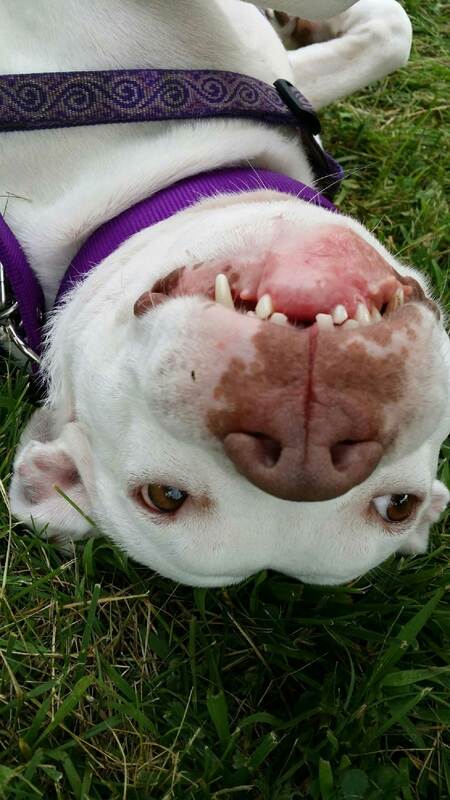 Chyna on her rescue day! 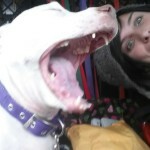 Chyna, after we begged her to exit her doghouse. We weren’t going to leave without her. 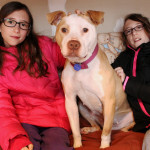 Befriending an aggressive & scared just-rescued Chyna. 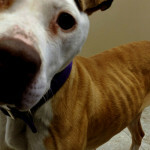 Chyna a few weeks after rescue! She was *that* skinny! 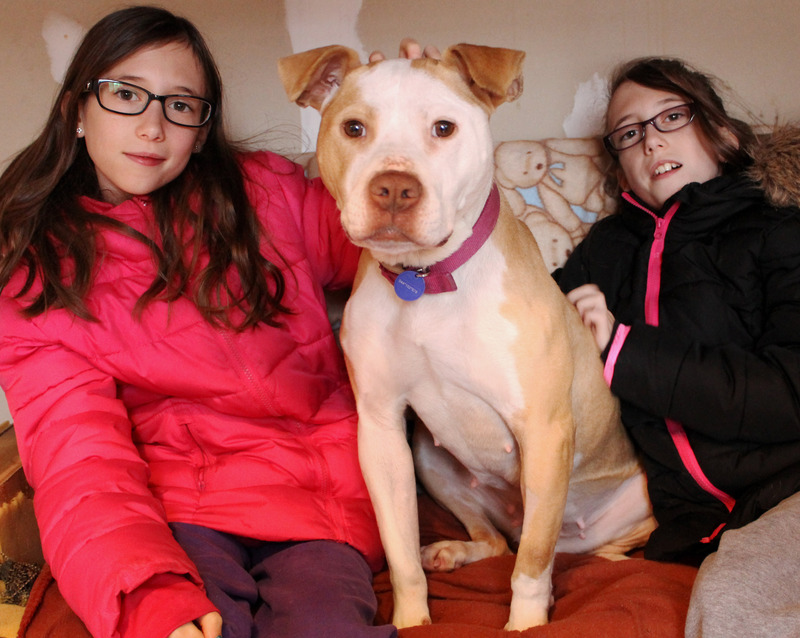 Chyna found lifelong love with her new family! 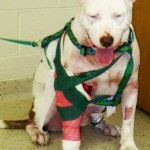 She was just another white “pitbull” on the end of a chain when we found her. And like the hundreds of others we reach annually, she lived a mostly solitary life in the backyard. A.S.K. 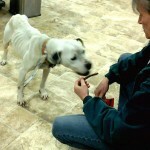 began helping her right on the spot: free straw, dog food assistance and hands-on examples to encourage her family to transform her quality of life to one of a dignified companion. A.S.K. provided a new life to Persia as a part of our special-needs Sanctuary. She wouldn’t tolerate the most passive of dogs, but she would tolerate them through the fence. And she was full of love for us humans. 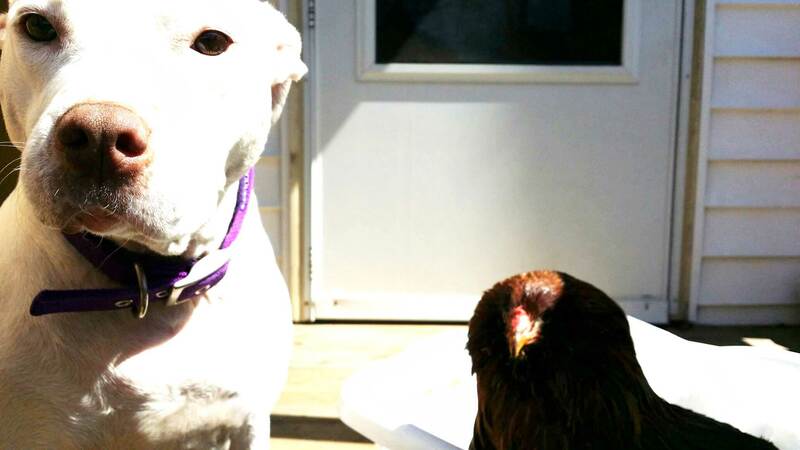 Persia lived in our Sanctuary barn adjacent to two other dogs for five years until tragedy changed her life, and ours: an unexpected and unforeseen brutal fence fight. 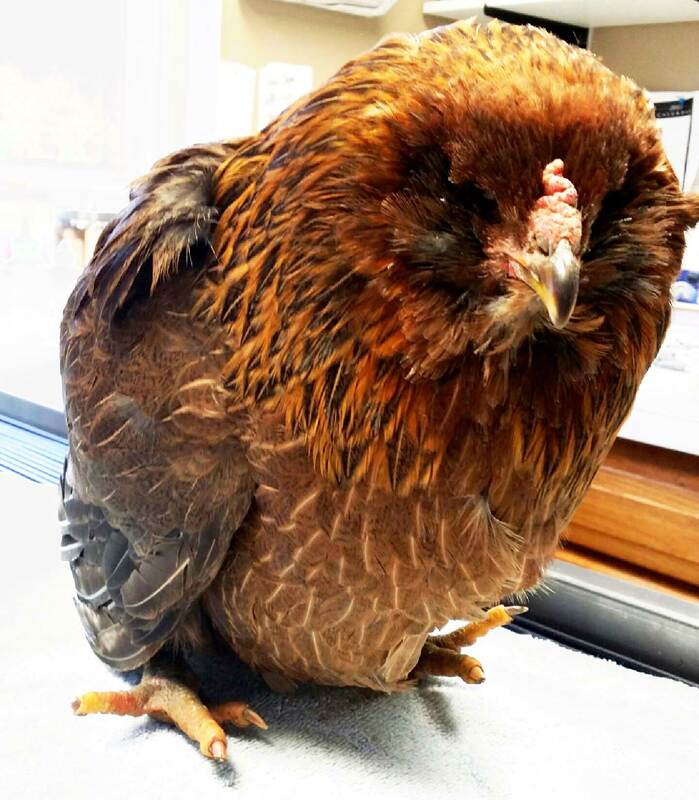 While no caretakers were present, Persia’s “pals through the fence” became her worst nightmare and when her primary caretaker arrived back in the barn approximately 45 minutes later, half of Persia’s face appeared to have been ripped off. Through the fence. She was wagging her tail, like always, eager for human interaction. 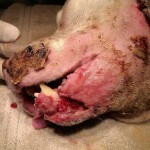 The fencing had no damage, and the other two dogs only had superficial cuts to their faces. 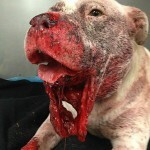 It appeared that one of them had gotten Persia’s lip and just kept pulling and pulling. As a result, her lower jawline musculature was gone, and it appeared like she had no lower jaw. 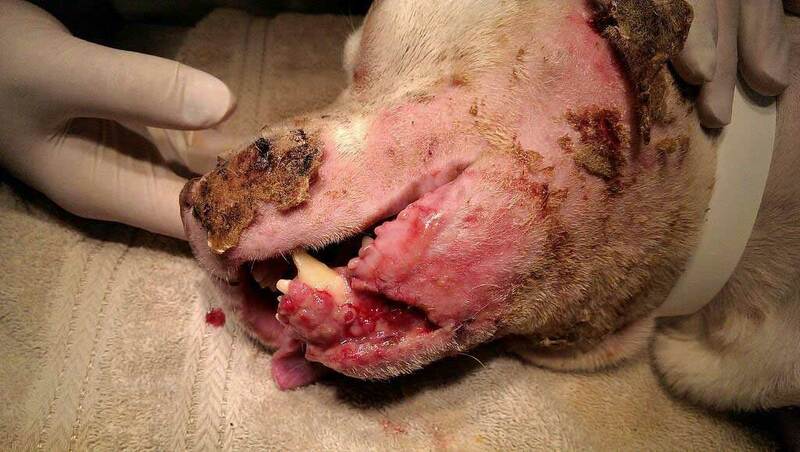 There was also significant damage on the top of her mouth and around the gumline. 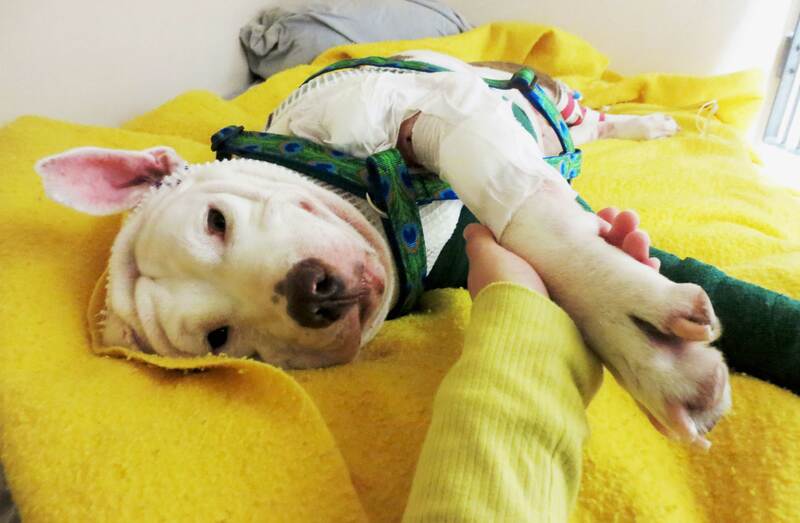 She was rushed to Michigan State University emergency room and admitted immediately, tail still wagging. 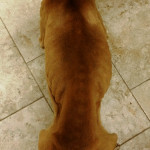 The ER vet stated that her injuries appeared “worst of the worst.” We weren’t sure if she would need reconstructive surgery, or even if she would survive. At the time we stated: “Persia’s face will probably never look the same. But we hope to see her beautiful smile again. 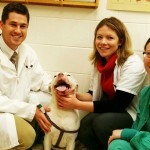 Persia underwent a series of surgeries, and increasingly beat the odds and expectations of her doctors. It cost A.S.K. 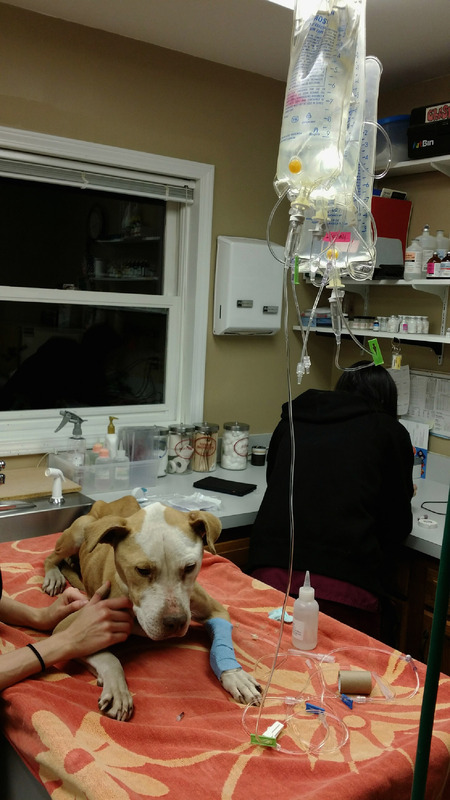 over $5000 to save her life, and thanks to donors we were able to pay her bills without affecting our street outreach services. Persia became a Superstar Survivor and touched the hearts of people all over the world. 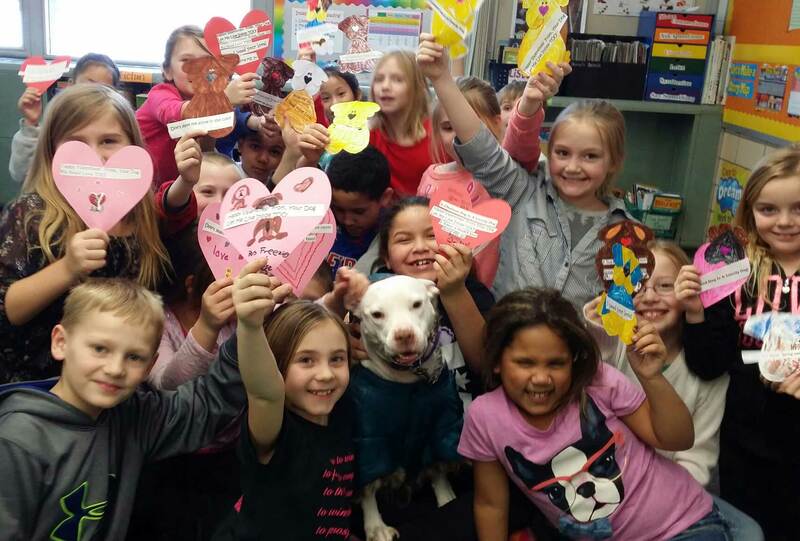 She continues to be one of our most charismatic ambassador dogs, making frequent public appearances in classrooms and at public events to help break stereotypes of “pitbull” type dogs. Horror scene: Persia is rushed to Michigan State University’s ER. 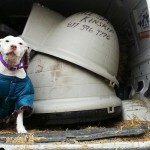 Persia delivers doghouses to dogs still living outside 24/7. 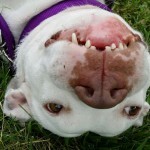 Persia is missing teeth & has significant scarring to add to her infectious smile! Persia and A.S.K. 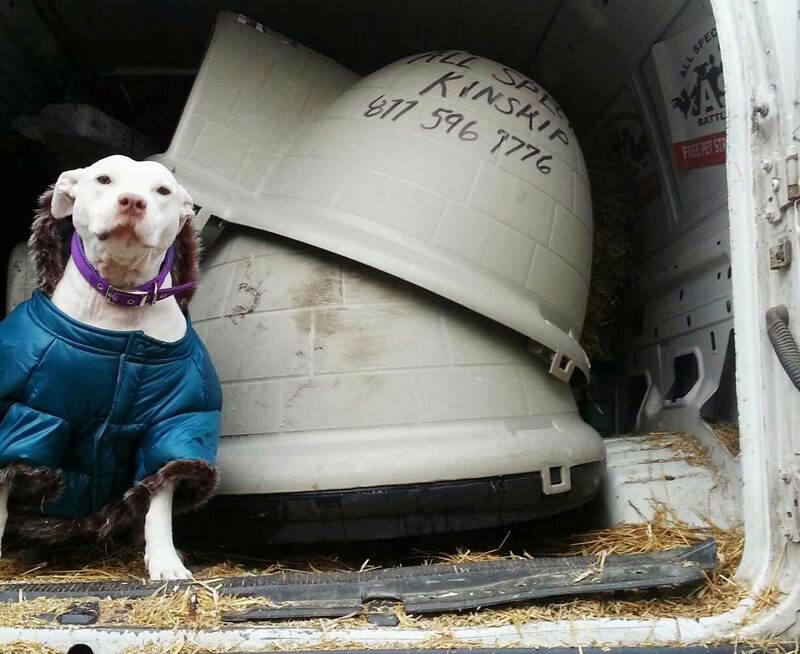 Executive Director, Sophia, working together to help chained dogs. 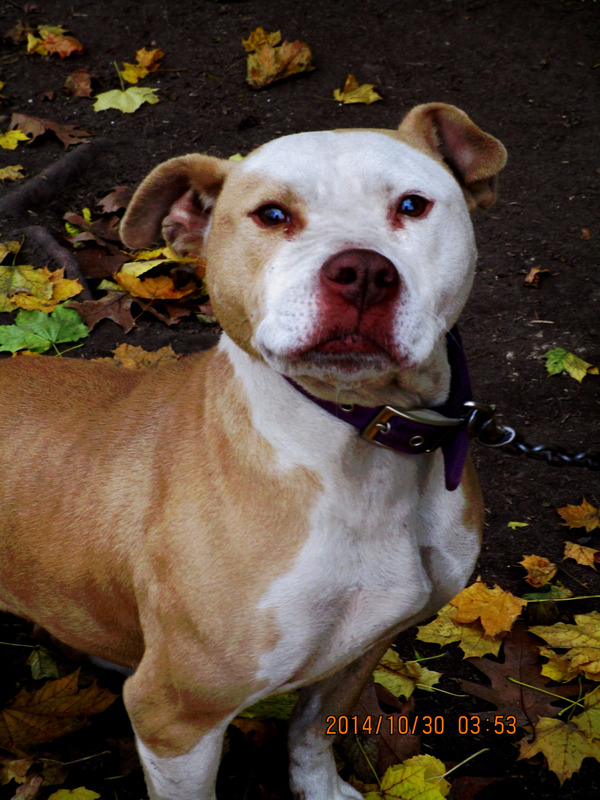 Persia loves breaking negative stereotypes of “pitbull” type dogs. 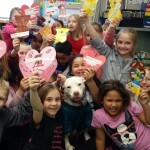 Persia visits classrooms and makes regular public appearances helping to break negative stereotypes about “pitbull” dogs. It was spring, and “eggs” were trending. Just a few weeks prior A.S.K. was enduring severe Michigan winter, and “frost-bite” was trending. 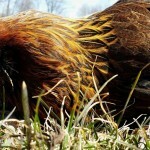 Eggs, winter, Easter and chickens: what’s the life of a chicken really like? We see their byproducts polished on the shelves at the super markets and at farm stands, but there’s a story behind every egg. Amidst the zero degree temperatures, All Species Kinship (A.S.K.) 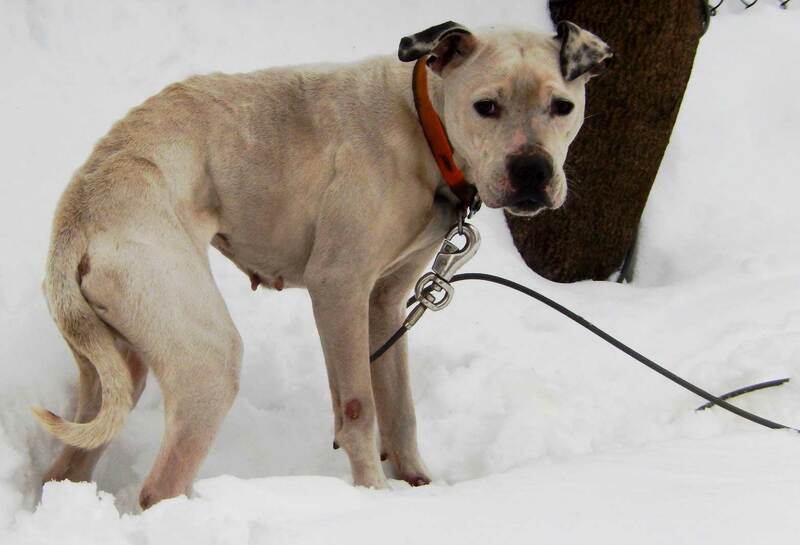 was driving up and down the city streets of Battle Creek, Michigan’s most underserved neighborhoods searching for chained dogs to make their lives better, while encouraging their guardians to bring them inside. 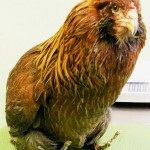 We did just that, but we also rescued numerous abandoned farm birds too, including a special chicken. 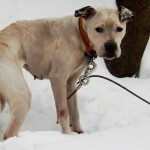 She was found frozen into a snowbank at a farm that had been in foreclosure. 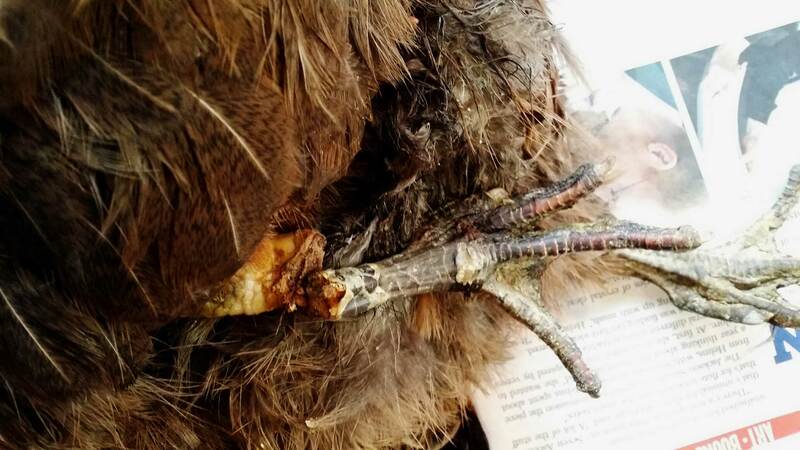 A literal block of feathers and ice, her feet and legs swollen—frostbitten–and unable to be moved without snapping in half. We named her Henna, and vowed to extend veterinary services to her just as we would for an ailing dog. 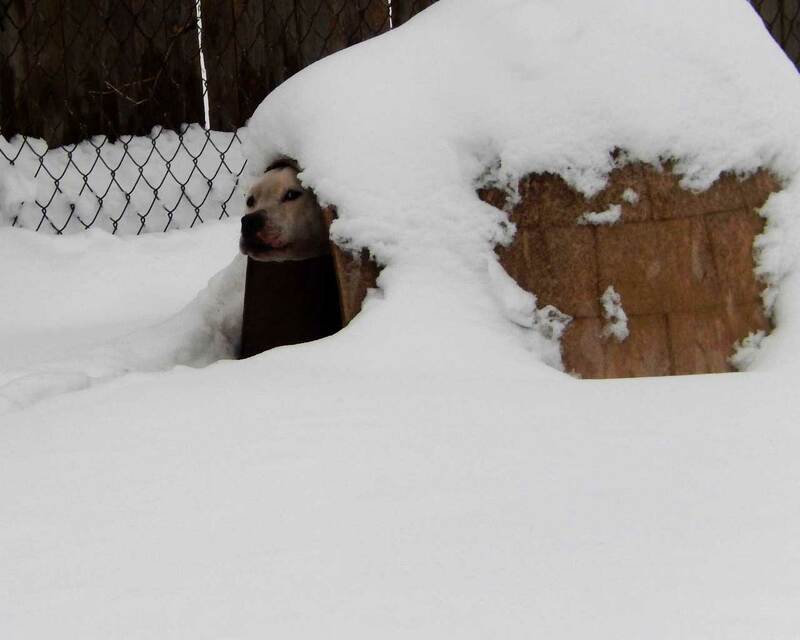 Frostbite is a tenacious risk to any animal facing long-term exposure to the elements. 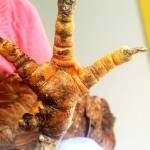 And chickens, native to the jungles of Southeast Asia, are at an increased risk due to their exposed skin. 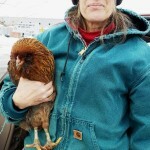 But how many media stories were covering “keeping chickens warm? 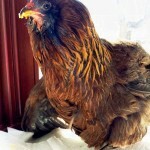 ?” We didn’t hear any, despite the increased popularity of raising chickens for backyard hobby farms. 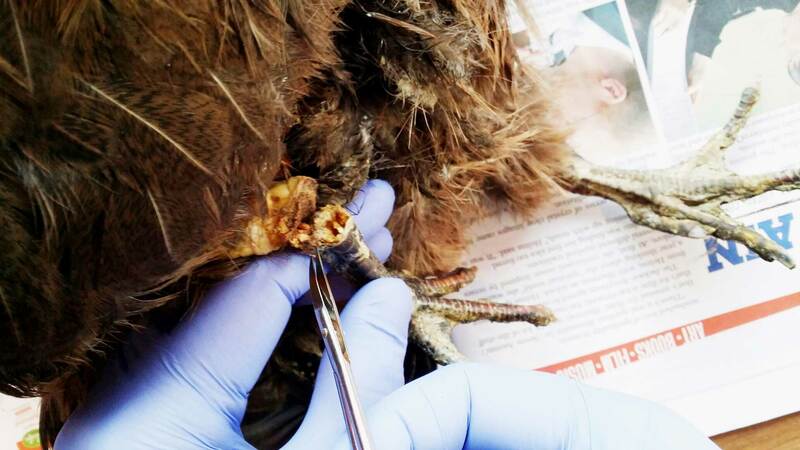 Henna’s frostbite was so severe that despite the best avian medical care, she lost function of both of her feet and a portion of each leg. These dead appendages hung on, and her toes began to shrivel. They were a constant reminder of the tragic existence she had survived. It was now only a matter of time before both legs would fall off. Words cannot describe the depth of the vocalizations that came from Henna as one leg fell off. 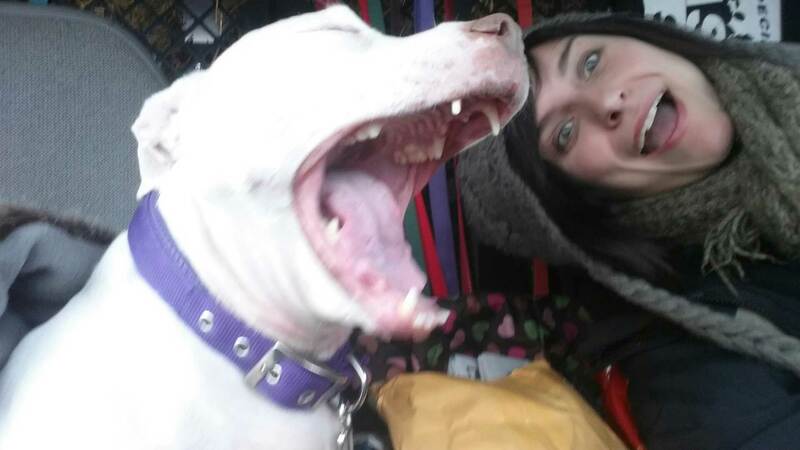 Her guttural cries resonated throughout my home like no cry for help that I had ever heard, despite over a decade of helping all species of animals. Henna had been maintained on a regime of pain medications, but even their therapeutic effects could not soothe her shock. 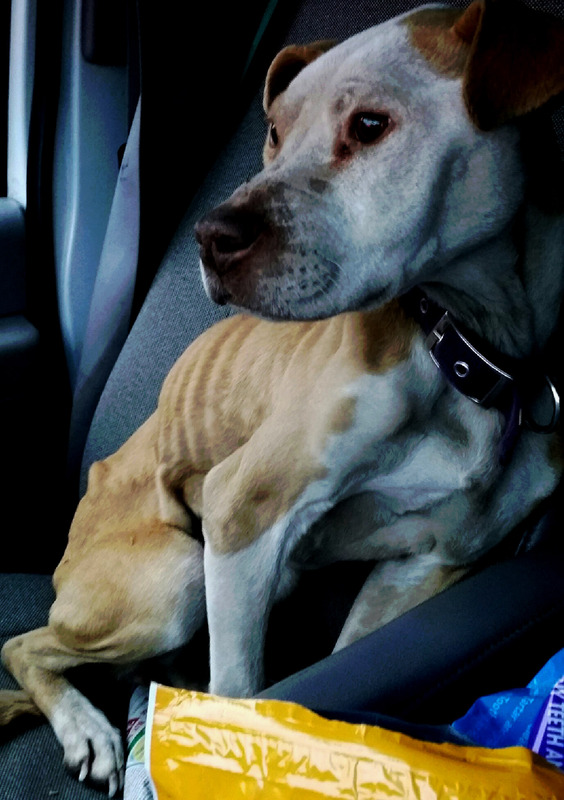 Her response was no different from a humans’, a dogs’ or a cats’–it was horror to suddenly be immobile. Yet days later, Henna was re-learning to walk, albeit differently abled, she still had a will to survive and a life to live. Henna proved that by continuing to go about her daily activities: preening, vocalizing and voraciously eating. 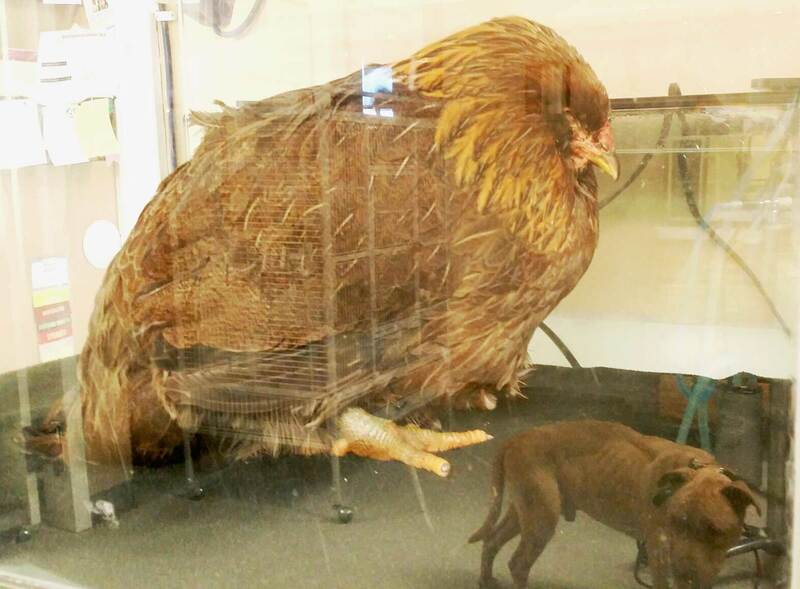 Nobody thinks twice about making an accommodation for dogs or parrots that lose limbs, so why not a chicken? 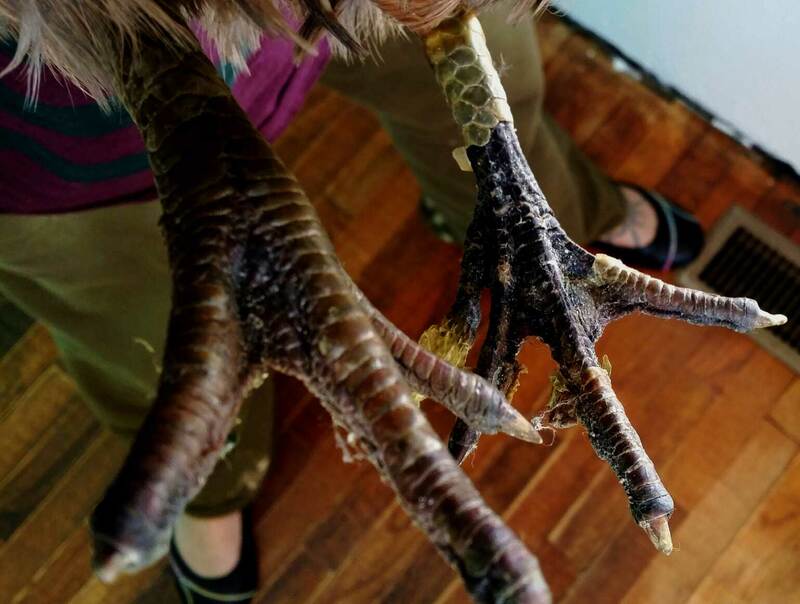 Many people were shocked that we’d invest in a bird “worth” a couple of dollars. But that’s what we did. A.S.K. planned to work with a prosthetic specialist to give Henna the ability to walk more easily again, but time wasn’t on our side. We soon learned that Henna’s ultimate deterioration, would again, be as a result of us humans. 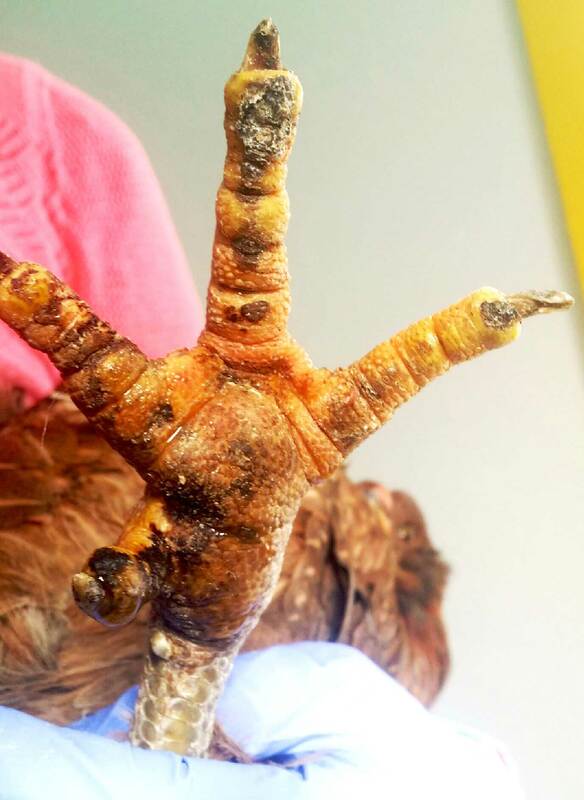 Reproductive disorders and ovarian cancer are so normal that companion chickens often have shortened lifespans. 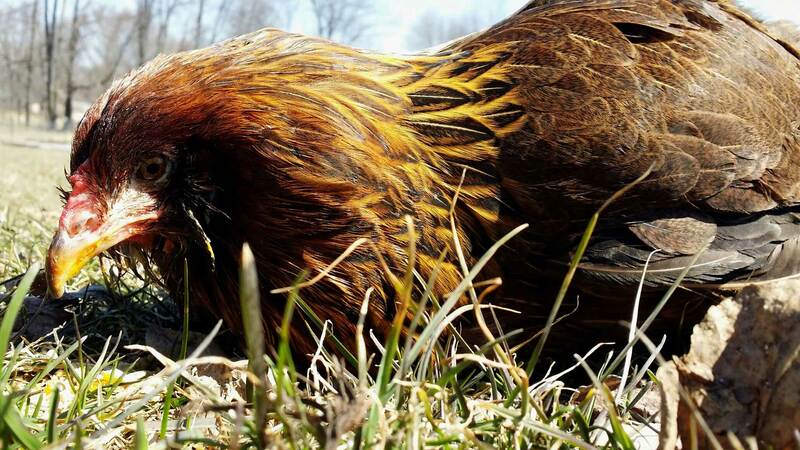 They are bred to over-produce eggs, and die young, even on small backyard farms. 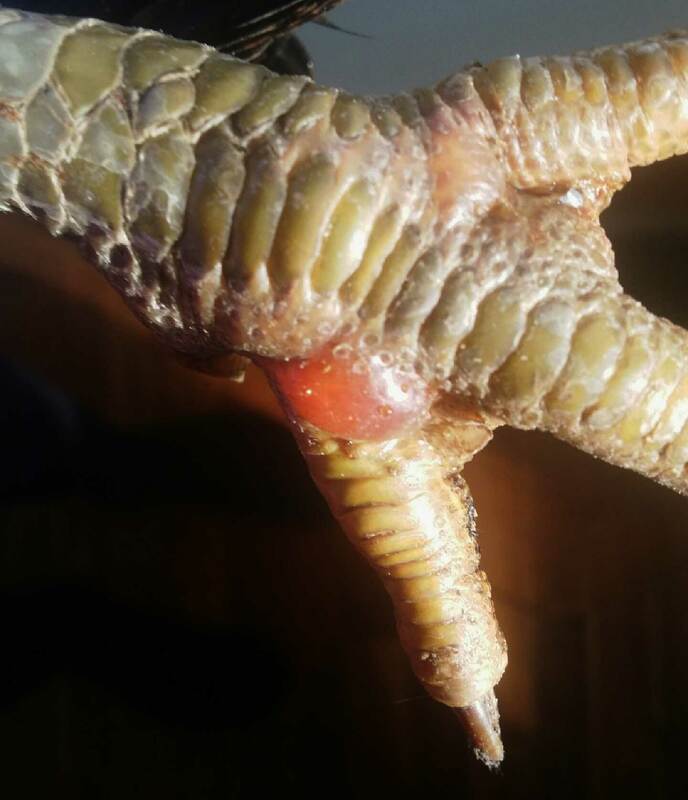 We soon learned that a maintenance diet for a chicken couldn’t even be found on store shelves. 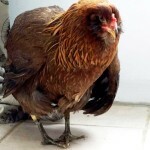 The story of a chicken has historically revolved around how many eggs they can provide us. Selectively bred, artificially induced, and denied adequate food and water, we have legally been permitted to treat them like machines, versus the independent, charismatic individuals they are. 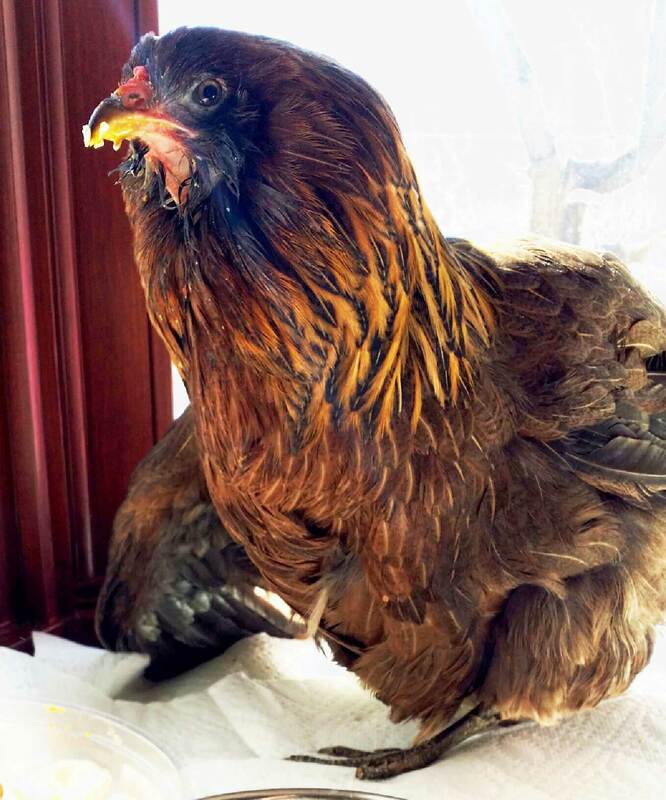 Henna was the egg, the forgotten novelty Easter chick, and now the “spent” egg laying hen that would have died in that snowbank in January had A.S.K. not rescued her. Yet despite our best attempts, her story comes to a close far too early. Henna traveled across the Midwest for expert diagnosis. 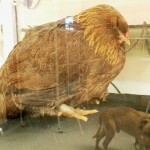 Her role quickly became that of an “ambassador chicken,” encouraging people to make more mindful decisions. If you haven’t watched a chicken enjoy a ripe tomato, strip an ear of sweet corn, or slurp the yolk of an egg, there’s more to learn. 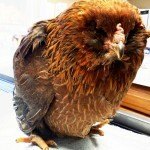 Henna spent two weeks in hospice care, continuing to enjoy “rock-picking,” car rides and bird-watching. 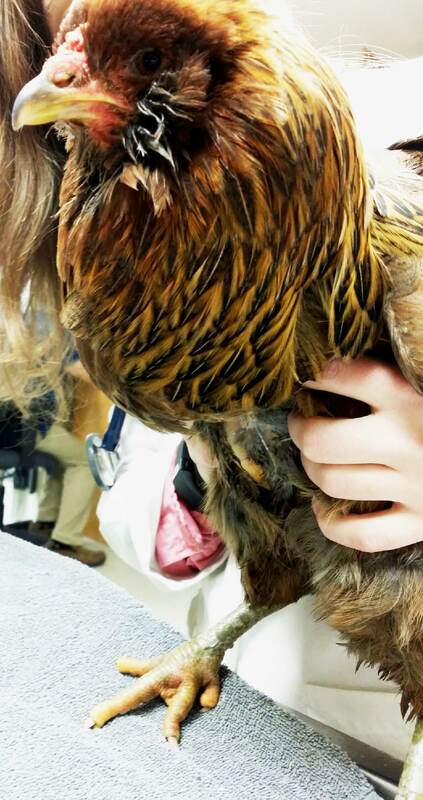 Once her quality of life diminished, she was given a dignified exit via a humane euthanasia by a veterinarian, while in the arms of her primary caretaker. 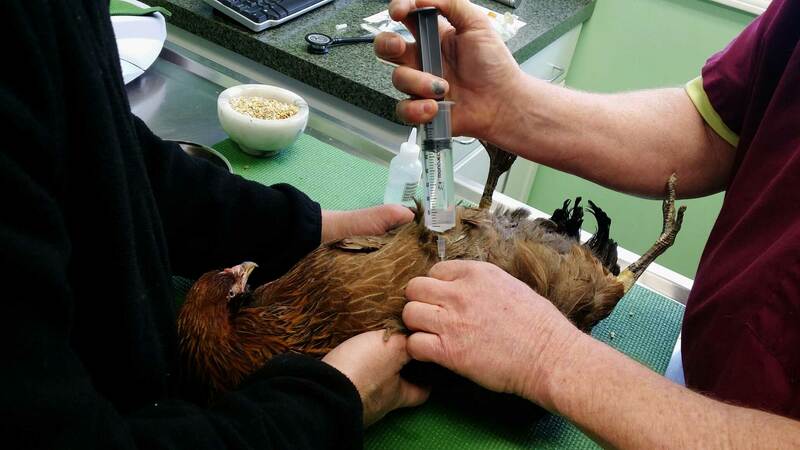 Instead of asking, “why spend thousands of dollars to save a chicken,” we should be asking: why don’t birds have any federal protections, and how is it that we can separate the egg from the individual? Henna rescued by A.S.K. volunteer Teri! 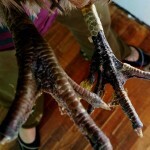 Henna’s feet cannot bend due to extended exposure outside. 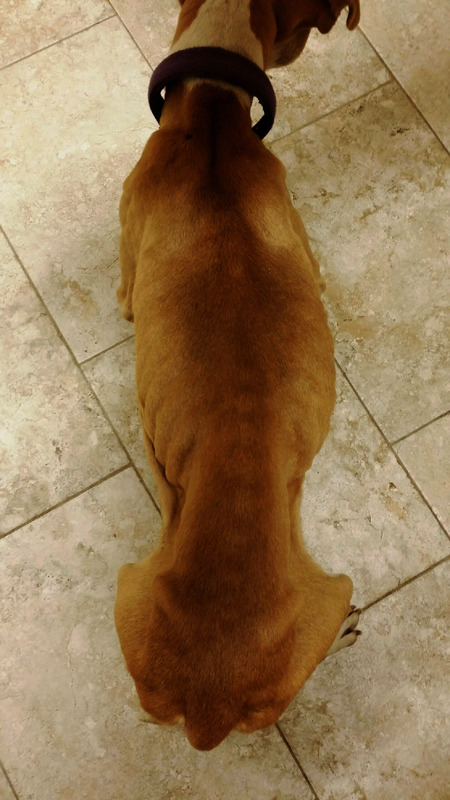 Upon intake Henna’s keel was prominent due to starvation. Henna is warmed up in an incubator. 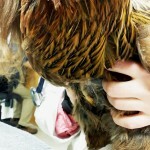 A skeletal dog is seen in the reflection; another rescue we were saving at the same time. 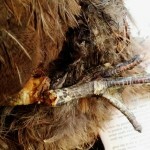 Re-hydrating a severely dehydrated bird. Swollen feet and blisters are indicative of frostbite. Blackened areas represent the beginning effects of frostbite. Henna adapts to standing on “dead” legs. Over the course of weeks, the skin dies and peels off. The feet/legs are totally dead. The beige portion of her leg is where the healthy, unaffected tissue begins. This is the degree of frostbite declaration. Eventually her left leg snaps off, as expected. 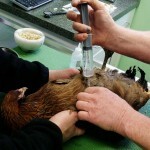 She cries out in shock, but was comforted by her caretakers (and had already been on a regime of pain mediciation). 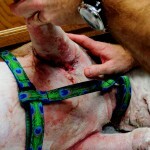 A portion of tissue has to be cut by her caretaker so that the leg can completely detach. 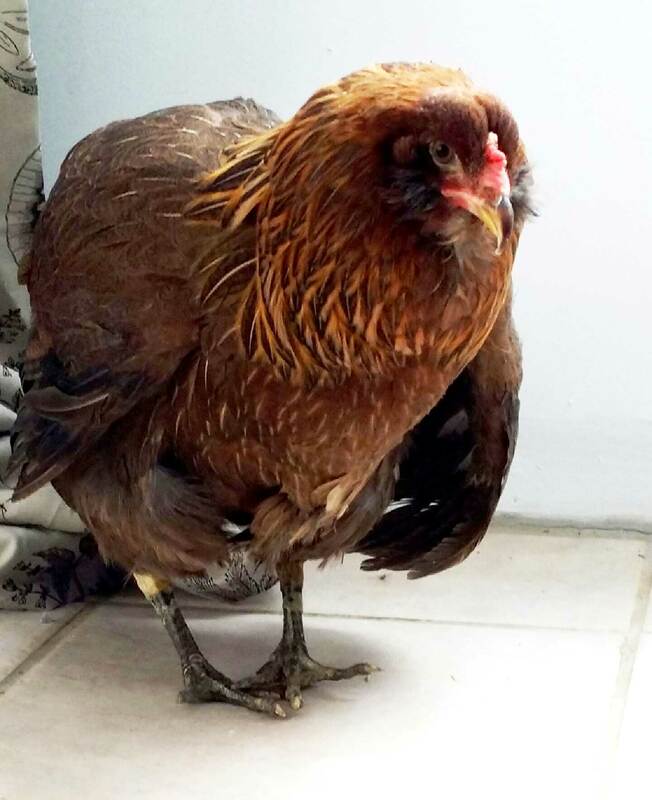 Henna stands like a champ on one leg. 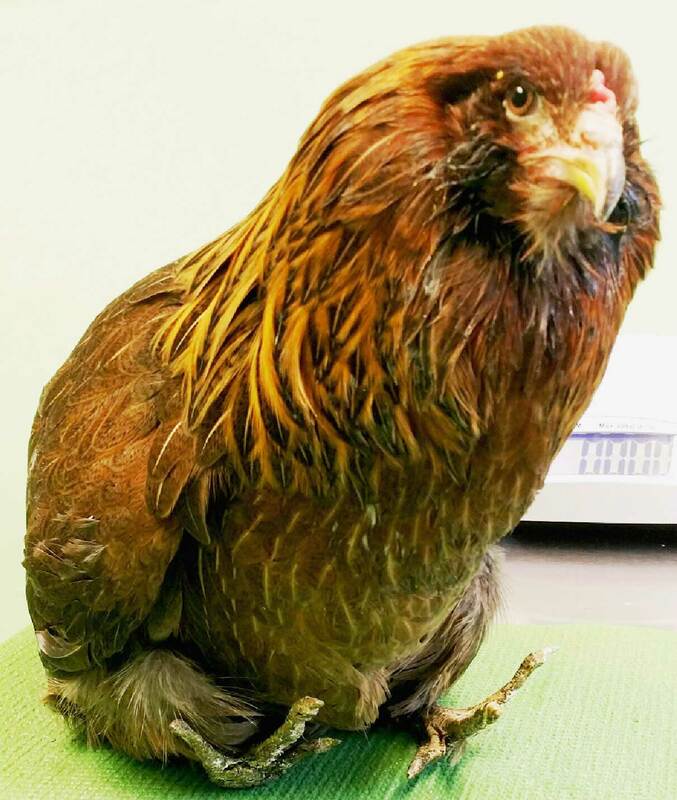 Henna may be differently-abled, but she still enjoys a great quality of life. 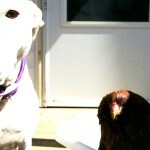 Henna and rescued survivor, Persia became good friends. 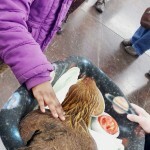 Henna raises awareness at the Grand Rapids Pet Expo, and is visited by hundreds of people who have never met a chicken as an individual.